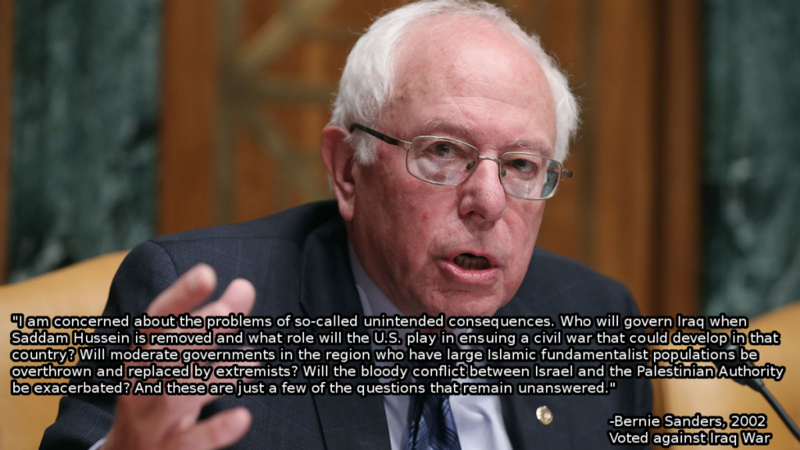 Speaking to the Guardian in an extensive pre-debate interview, the senator from Vermont criticised Clinton for carelessly fomenting regime change in Libya “without worrying” about the ensuing instability that has helped Islamic State forces take hold in the country. “Regime change without worrying about what happens the day after you get rid of the dictator does not make a lot of sense,” Sanders said. Foreign policy has recieved far more emphasis in the liberal media compared to the rest of the campaign coverage. I have looked at Hillary Clinton’s neoconservative and hawkish views multiple times. At Salon, Paul Rosenberg recently described how Clinton has been a neoconservative hawk, concentrating on her mistakes on Iraq and showing how she made similar mistakes in her failed policy in Libya. The foreign policy views she has held in the past should be taken as a warning of what to expect should Clinton be elected. As Secretary of State her more interventionist advice was overruled by more sensible people in the Obama administration. There will be no such restraints on Clinton’s militarism should she be elected. Of course, Saddam, as secular dictator, had no reason at all to behave as Clinton described. He and bin Laden were bitter ideological enemies, and the only thing that could bring them together was necessity and a common enemy they hated and feared more than each other. That would be us. And although both Saddam and bin Laden are dead, their followers have joined together to fight us. That is, in fact, the origin story of ISIS—or at least a crucial part of it, as counter-terrorism expert Malcolm Nance has explained, talking to William Arkin, for example. There is more worth reading on how the invasion of Iraq led to the later threat from ISIS. After all, Clinton herself pushed hard for a similarly flawed regime change strategy in Libya—Conor Friedersdorf even compared her role in Libya to Cheney’s in Iraq. Hyperbolic? Yes. But he did have a point. As summarized by Joel Gillin at the New Republic, she did get carried away with questionable intelligence, over-focused on deposing a long-time U.S. bogeyman, and failed to give sufficient consideration to the depths of difficulties that would follow afterwards. All of which allowed the broader jihadi threat increased opportunity to spread. In particular, the key claim that something genocidal was about to unfold was entirely unfounded, according to a lengthy review of the Libya intervention at the London Review of Books, which noted that “in retaking the towns that the uprising had briefly wrested from the government’s control, Gaddafi’s forces had committed no massacres at all; the fighting had been bitter and bloody, but there had been nothing remotely resembling the slaughter at Srebrenica, let alone in Rwanda.” Given that Libya had normalized relations with the West in 2003/2004, renouncing its former international outlaw role, including an active WMD program, it was strikingly counterproductive to turn on Gaddafi like that, if you want to coax other “rogue states” into the community of nations. In a normal election year, Clinton’s failures as Secretary of State would be a major election issue. We are now seeing the same mistakes with Clinton’s views on Syria. However, Clinton benefits from a double standard in which many Democrats feel that it is somehow unfair that Clinton be criticized or held accountable for her views, and the many mistakes which have characterized her career. Some claim that criticism of Clinton is a right wing plot, when they are the ones backing right wing policies in defending Clinton’s record. Criticism of Clinton is written off as Clinton Derangement Syndrome, with the conservative Democrats who make this argument echoing both the words of those who defended George W. Bush with cries of Bush Derangement Syndrome, and as a result pushing for what would amount to a third term for George Bush’s policies (with the ethics of Richard Nixon). She said, “If we had not joined with our European partners and our Arab partners to assist the people in Libya, you would be looking at Syria.” In reality that is what we are looking at. As the Harvard (Kennedy School) Lessons from Libya study of 2013 found, “The biggest misconception about NATO’s intervention is that it saved lives and benefited Libya and its neighbors.” Radical Islamist groups, suppressed under Qaddafi, emerged as the fiercest rebels during the war, highlighted by the September 2012 attack on U.S. facilities in Benghazi that killed Ambassador Christopher Stevens and three of his colleagues. Clinton talked at this last DNC debate about her failure as Secretary of State as if she was successful. While she held that office, the U.S. spent about $2 billion backing the Libyan uprising against Qadaffi. The uprising, which was part of the Arab Spring, led directly to Qaddafi being removed from power and killed by rebel forces in 2011. Now some 2,000 ISIS terrorists have established a foothold in Libya. Sophisticated weapons from Qaddafi’s arsenal—including up to 15,000 man-portable, surface-to-air missiles have apparently fallen into the hands of radical Islamists throughout the region. For a Secretary of State (and a Presidential administration) this is foreign policy leadership at its worst. The first rule of wing-walking (and regime change) is never let go of what you have until you have a firm grasp on where you are going. Clinton lacks any real grasp of the dangers of interventionism, repeatedly making the same mistake she made in supporting the Iraq war. Her mistakes on policy, including but not limited to foreign policy, are far more important than the mistakes she has made campaigning this year which the media is more likely to discuss.